A species of dry forests and thickets, but with no extant occurrences known. This species was collected by the First Survey in 1838 in both Calhoun and Kalamazoo Cos., but not since then. Additional old specimens attributed to Michigan, unfortunately without further locality or date, include a sheet in GH, labeled in the hand of Asa Gray and two sheets (MICH) labeled in later hands. These may be duplicates of the collections with complete labels (at NA), or perhaps additional collections made by the First Survey. 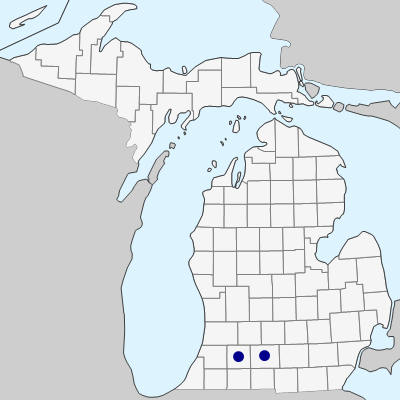 Scutellaria incana is known from northern Ohio and Indiana, and thus is not wholly unexpected in Michigan. MICHIGAN FLORA ONLINE. A. A. Reznicek, E. G. Voss, & B. S. Walters. February 2011. University of Michigan. Web. April 20, 2019. https://michiganflora.net/species.aspx?id=1595.